This simple mod allows to convert energy from ic2 power tanks (like MFE, MFSU, BatBox etc.) to BuildCraft power tanks and vice versa. And it doesn't require any mods to be installed. 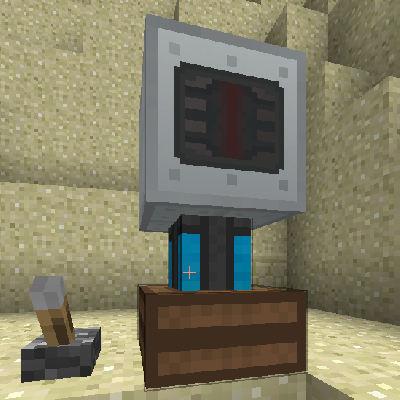 For example if you put IC2 BatBox with 40k energy and Thermal Expansion Energy Cell adjacent one to another they will be balanced by energy value.This mod not detects power storage capacity, so you can capture power draining if your storage will be completely full. Voltage is limited by 4096 units, so energy can't exchange faster per each 32 world tick. I support this mod. So you can send me your bug-reports or recommendations. Version 2.2: Fixed internal modname. Version 2.3: Now works with ic2 classic. Version 3.1: Many bugs fixed. Now works using java reflection. Version 3.3 Fixed IC2 Classic (not experimental) don't auto-rerender energy level line when it's transmitted. 0. Delete previous versions of this mod if you have and make world backup. 2. Put jar from the mods folder to your minecraft mods folder. New version may not works wit extrautiliets and other mods, wait for updates. You can freely distribute this mod. Id have to agree with the interface....except for 1.10.2 when buildcraft gets there :-) Call it pre support. It should accept both energies at all sides, and also provide them like this. Converting logic (such as power ratios [20RF<->5EU according to FTB Wiki]) should stay the same. I know that not many people would use this, but the ones using it would be very happy :D Also, it would be the first block to convert between RF and EU in 1.8.9, so it could get into some modpacks (such as mine). PS: I also sent this as a private message because I don't know where to send such things... I just tried both. Ok. I have attached some images of some trouble I'm having. As you can see in the photos, I have placed down a batbox, in the proper direction and then placed down capacitor banks from Ender IO and you can see that there is no power being transferred into the capacitor. What am I doing wrong? It's temporary defect of my mod. Sorry wait for update. I will try to fix it. That's happens because I transferred energy access from NBTtags system to java reflection and not every mod energy can be detected. I will add fixes soon. I get this crash with 1.8+ version. Ahh, wait 3.4 version update, I'll fix it. You can download new 3.4 version. This bug has been fixed. Just asking are you planning to port this to 1.8.9? or is everything too new and different todo this kind of thing right now? You can download Stabilizer-3.2-1.8.9.jar now. Hope you enjoy! oh, and will this work with ic2 classic by spiger? Mod converts buildcraft energy to ic2 energy and vice versa. So, if buildcraft on RF and IC2 on EU then yes. Now it works with ic2 classic since 3.1 version.